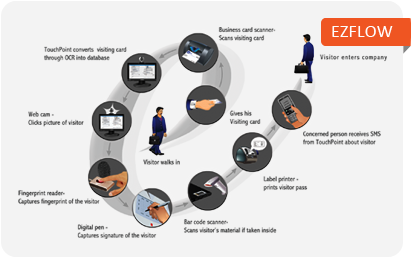 TouchPoint Visitor Management is futuristic web based software to manage visitors at office. It does away with the obsolete pen and paper system of gathering visitor information and brings in a professional approach to visitor management. No more scribbling in the visitor book, issuing used badges, calling the employee to inform of the visitor's arrival, unattended visitors in crowded reception areas and most importantly, worrying about security issues. By using TouchPoint's multi-tenancy VMS, facility managers can easily do away with the long queues that tamper the image of the facility, speed up the multiple registrations process, facilitate better allocation of resources to allow security guards to carry out their primary tasks, and eventually fortify the security of the premises. Office management refers to the organisation and supervision of all administrative functions that facilitate the smooth running of the office.